As a VR developer, the biggest problem I face currently is input devices. Many VR applications use gamepads or keyboard and mouse for controls, but these devices are inadequate for VR. You need to be able to use your hands in VR to truly feel a sense of presence. The problem lies in the fact that different applications require different types of interactions, and there is not any single device that is perfect for all of them. Devices such as the Leap Motion use a depth camera to track the position of your hands. This works well for applications that require simple gestures and just need the position of your hands. Historically, the glove is one of the primary input devices used in VR. Control VR is a glove system being developed for the consumer VR market. Gloves are perfect for applications that involve manipulating and grasping objects with your hands. Games, especially first person shooters, call for a different type of interaction since not only do these games need the position of your hands but they also require you to press buttons to shoot your gun or open a menu. Currently it is unlikely that you own an Omni, so you will also need joysticks to move your character in the game world. For these games a controller like the STEM system from Sixense works best. The STEM system features two controllers that you hold that track the position of your hands. Each controller is wireless and features joysticks and buttons, making it the perfect controller for games and some other applications. Most of the controllers that have been created for consumer VR are not in the hands of most VR enthusiasts, let alone your average consumer or even gamer. This makes it very difficult for developers to build applications that take full advantage of VR since most of their target audience does not own the required input devices. As Palmer Luckey stated at the SVVR Conference and Expo in May 2013, there are no standards for input devices yet. It looks like there will not be any time soon. Oculus acquired the Carbon Design Group in 2014 so most likely they will be producing their own input device. If Oculus decides to ship a motion-tracking controller with their first consumer Rift, that will at least give developers a standard, but until then input remains a significant problem (and it likely still will be even if Oculus ships a controller). This is probably the hardest problem listed in this article. When you reach out and touch a wall in a VR world, you want to be able to feel that wall. Clearly the hardware to support that level of feedback will not be available any time soon. The name for this technology is called haptics. It is the technology that allows you to feel tactile feedback from the virtual environment. Games have historically used simple mechanisms to provide crude haptic feedback, such as “rumble packs.” Fortunately it is possible to create spectacular VR experiences without haptic feedback. While haptics would greatly improve VR, the lack of haptics is not a roadblock to the success of consumer VR. An HMD that is too heavy is sure to reduce the user’s sense of presence in the environment. It is difficult to forget that you are wearing something on your head when it feels like a dumbbell is strapped to your forehead. Most high-quality noise canceling head phones add even more weight to your head (not to mention wires which I will address in the next section). The Oculus DK2 weighs 0.97 lbs which is slightly heavier than the DK1 which weighed roughly 0.83 lbs. The DK2 is too heavy, but fortunately Oculus has proven that they can significantly reduce the weight of the HMD with their latest prototype, Crescent Bay. While I do not have the exact weight of the Crescent Bay, I have tried it and can assure you that it weighs much less. It also includes built-in headphones so you do not have to further burden your head with more weight. The Crescent Bay proves that HMD weight is a solvable problem, and we can look forward to lightweight consumer VR hardware. Nothing zaps you out of an immersive VR experience like the feeling of a wire snagging the corner of your desk, or getting tangled in the wheels of your office chair. Desktop VR in its current state is a mess of wires. Mobile VR devices like the GearVR circumvent this problem, but have less processing power than a gaming desktop and currently do not have native support for positional tracking. The question remains, will the Oculus Rift CV1 be untethered? I think the answer is most likely no. That does not mean that the CV1 will be a bad experience. It will be spectacular. However, before it can reach perfection, wires are one more obstacle that consumer VR hardware must overcome without sacrificing other features like positional tracking. Since the Oculus Rift Kickstarter ignited the consumer VR spark in 2012, the resolution of consumer VR HMDs has significantly improved. 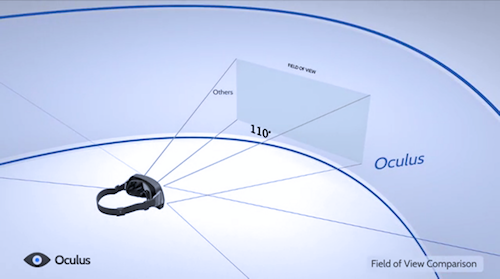 The Oculus Rift DK1 had a resolution of 1280 x 800 (640 x 800 for each eye). The pixelated display reminded me of the first time I played Quake for DOS in 1996. For me this added to the charm of the device, but clearly higher resolution was desired. The display also suffered from what is known as the “screen door effect,” which causes black space between pixels to be noticeable to the user (this is exacerbated by the fact that a lens is magnifying the screen). The Oculus Rift DK2 resolution is substantially higher at 1920 x 1080. Even at this resolution, I have heard many casual users complain that the screen looks “blurry,” and the screen door effect is still apparent. Luckily the resolution of the Crescent Bay prototype is outstanding and the screen door effect is reduced, and the recently-released Samsung GearVR has a resolution of 2560×1440 which is sufficient for consumer VR. Screen resolution and the screen door effect will be solved problems for consumer VR. VR is pricey. Consumer VR hardware is substantially cheaper than the VR hardware that has been historically used by research institutions, but it is still expensive. Currently even a basic VR setup can run at least $2,000. This cost includes a desktop or laptop with a high end graphics card, and an Oculus Rift DK2 ($350). Also, some type of motion-tracking input device is a requirement if you want a more complete VR experience and that could cost an additional few hundred dollars. The Samsung GearVR is powered by the Galaxy Note 4 phone so it does not require a desktop or laptop. However, the Note 4 phone is $800 unless your mobile provider subsidizes it in which case it will cost around $300. The GearVR itself costs $200, so the total cost of a gear VR setup is $500 – $1100, and you would probably want to throw in an Android gamepad as well. There are lower-cost mobile VR options like Google Cardboard. They may be fun, but they do not deliver anywhere near the same level of immersion as the Rift or the GearVR. Currently the VR market is fragmented and littered with peripherals being manufactured by different companies (most of them are kickstarter-funded projects that have not even shipped yet). These devices include the motion-tracking input devices like the STEM system from Sixense, treadmills for locomotion like the Virtuix Omni, haptic vests like the KOR-FX gaming vest. We can also expect additional devices to arise that simulate other aspects of reality. I am waiting for someone to try to market a smell generator. I doubt it will fly as a consumer product, but I would not be surprised if we see one in the next few years. If you want to set up a full consumer VR experience you have to buy several pieces of expensive hardware from different manufacturers. Currently that limits the full experience consumer VR to die-hard enthusiasts. Still, I have known gamers to spend absurd amounts of money on hardware such as graphics cards in the past. That leads me to believe there is a contingency of gamers that will splurge on VR (or their parents will do it for them). Outside of gaming, VR is being hyped for a plethora of applications such as social interaction, education, and enterprise. For VR to succeed in all of these areas the hardware must be affordable to more casual users. Fortunately not all of the fancy peripherals are required for most users, but even the basic HMD and computer hardware are too expensive right now. When this hardware reaches the mass market the costs will gradually be reduced, but by how much and how soon remains to be seen. Despite aforementioned problems, VR will be successful as a consumer product. The bottom line is that even though we cannot achieve a perfect VR experience for consumers right now, they are still fascinated by the current hardware and software. VR suffers each of the weaknesses I mentioned in this article. Some of those problems will be solved when VR hits consumers such as latency, resolution, HMD weight, and positional tracking. Others such as haptics and locomotion will linger for years, but neither of these are showstoppers. The Oculus Crescent Bay prototype gives a glimpse into what consumer VR will be like, and it is far beyond what we have now. I am devoting my life to VR for what it will be not for what it is, but it’s pretty damn good right now.